1115, HUBCAP USED, 13", 1985, BUICK, SOMERSET, MACHINED, PAINTED GRAY 22 SLANTED SPOKE, BLACK, CHROME & BLUE LOGO, TURBINE SPOKE TYPE. 1204c, CHEV, DOG DISH CAP USED, 82-94, S-15, CHROME OUTER RIM, BLACK CENTER, RAISED CHROME BOWTIE, PUSH ON, 2"X10-3/4" DIA. 1646a, CENTER CAP USED, 89-93, CADILLAC, DEVILLE, SIXTY-SPECIAL, FLEETWOOD, METAL, MACHINED OUTER RING, BLACK CENTER, CHROME LOGO, 7" DIA. 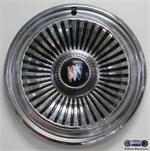 3053b, CENTER CAP COPY, 93-97, LINCOLN, TOWN CAR, CHROME CAP WITH BLACK CENTER, 6-1/2" DIA.